240V 1PH 7.6KW Explosion Proof Convection Heater T2A Temperature Code. 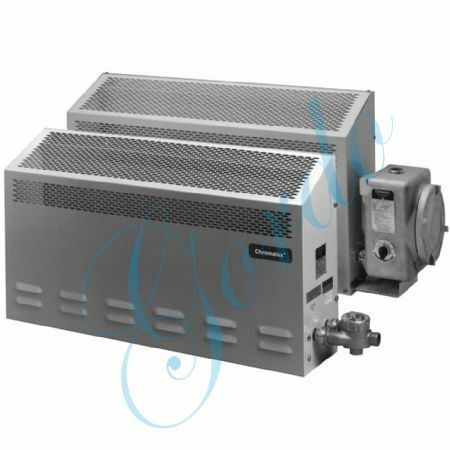 Type CVEP explosion proof convection heater is designed to provide a rugged, corrosion resistant heat source for areas where volatile flammable liquids, gases or vapors are present. All basic models without controls are UL listed and CSA certified for use in areas designated as Class 1, Division 1 or 2 Group B, C or D locations. Cabinet — Sloped top, constructed of heavy 16 gauge steel, polyester powder coated for maximum corrosion resistance. Explosion Proof Junction Box — For conduit entry and ease of power wiring. Heating Elements — Sealed, metal sheath, heavy-duty, low watt density, enclosed high grade resistance wire embedded in MgO refractory core. Elements are inserted in a copper tube with aluminum fins. Integral Mounting Brackets allow for easy wall installation. Sloped Top Cabinet ensures maximum ventilation by preventing objects from being placed on the top which would restrict air flow.